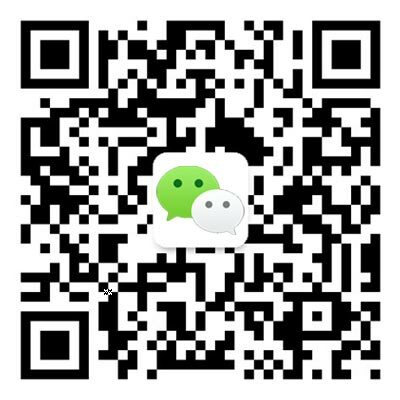 The first four weeks of the new year at the International School of Beijing (ISB) have been packed with performing arts auditions and preparatory sessions, showing a balance of inclusivity and encouraging students to strive for excellence. While every ISB Middle School (MS) student is offered drama classes within the curriculum, MS and High School (HS) teachers also run selective auditions to give the most dedicated young actors, musicians and dancers the chance to challenge themselves to prepare for quality performances. Meanwhile, the Elementary School (ES) performing arts program ensures every student can try out acting, music and dancing and take part in shows. 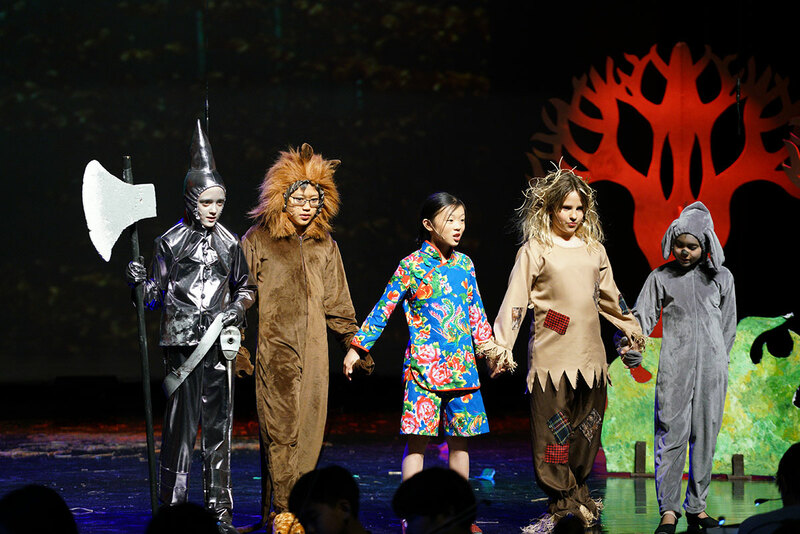 From curricular to co-curricular activities, performing arts at ISB is based on the Whole Child approach that values young learners' physical and social-emotional health along with their academic performance. The school believes students should be developing skills, strength of character and passions for life as well as the knowledge to pass exams. This year, ES performing arts teacher Cyndi Campbell expects to run two levels of choir, involving around 170 students; four levels of strings, also involving around 170 students; and two levels of band, involving around 70 students. In the second half of the year, there will be the annual ES musical. 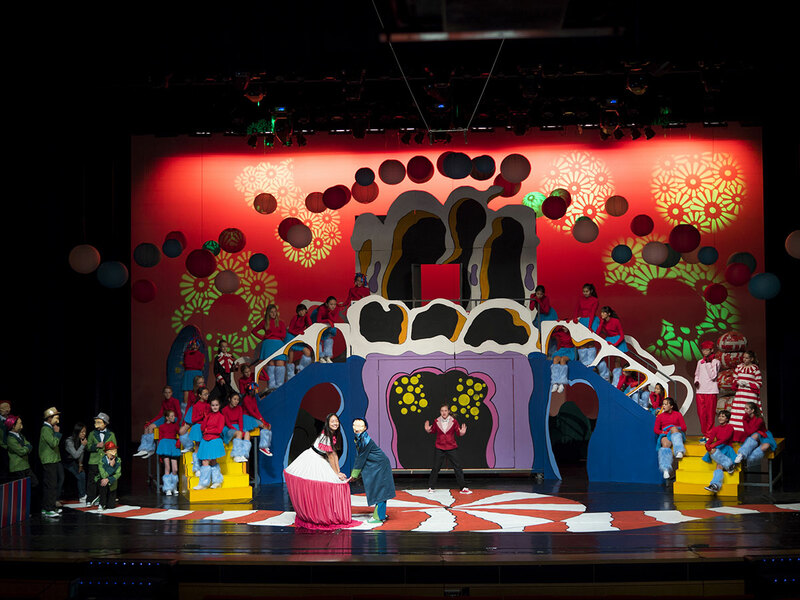 Last year, 130 ES students flaunted their talents in The Wizard of Oz (pictured, above). "Offering all these things, the goal is to make them not only lifelong learners, but also lifelong aficionados of the arts," said Ms. Campbell. "The more they can be involved in it, the more chance they'll still be appreciative of going to a concert or going to a show, or pulling out a piece of music and singing along 30 years from now." A big concern in ES music is avoiding excessive focus on musical qualifications and instead building a love of playing instruments. "Our job is to get students to like it, to make sure that while they are learning, they are also enjoying themselves," explained Ms. Campbell. Another main focus is on integrating performing arts with other academic subjects. "We work hard to connect our units to what's happening in the classroom," according to Ms. Campbell. For example, for several years, the fifth grade studied explorers and then worked on music and dances from some of the places visited by Medieval traveler Ibn Battuta. In the MS, drama and dance teacher Hannah Northcott has just finished whittling down about 60 students who signed up to audition for a production of the musical Honk! into a cast of 40. After selection by an audition panel including Ms. Northcott, vocal and music coaches, choreographers and stage managers, the successful students will prepare for performances in November in after-school classes. Those who didn't make it can develop their skills during curricular drama classes and come back to try again in auditions next year – stronger for the experience, believes Ms. Northcott. "Auditioning develops resilience in students, as we teach how to take possible disappointments and turn them into winning moments," she said. "ISB is unusual in that all MS students get drama within the curriculum. Grade 6, 7 and 8 all have one trimester of drama. No shows are produced in these classes. Students just perform for their peers, which grants them safety to develop their skills. For those that want a bigger audience and who really want to go beyond the standard and demonstrate mastery of the skills, they can participate in the after-school production." Ms. Northcott said students with the conviction to take part in a major production at ISB will invariably be inspired by an unsuccessful audition to work on their skills and improve in time to secure a part the following year. This is of course a principle that applies not just to performing arts, but to many other situations and selective disciplines. For Ms. Northcott, a practicing artist and veteran of many auditions herself, "Life is one big audition and facing any trial like an audition is like depositing money in the bank. Whether you get the part or not, it's a learning experience." She wants to offer her students a glimpse into what a career in the arts is like and also prepare them for any other future they choose to pursue. "What is happening at ISB is an authentic experience. As a performer, you might get 100 auditions and get callbacks for 20 of them. If students really want to pursue performing arts, they need to develop resilience to face that positively. "On the other hand, if they don't want to get into professional acting and drama's just something they do for fun, it's an opportunity to develop a growth mindset. Students can think 'I tried out for something and didn't make it. What could I have done better? How much time did I spend preparing for the audition? What did the successful students do that I didn't?'" The principles are perfectly illustrated in this tale of personal growth, related to Ms. Northcott by one student: "In sixth grade, I was one of those students who would scowl at the mention of anything drama-related. However, after I watched the MS play The Seussification of Romeo and Juliet (pictured, above), I realized how fun drama can be. "Therefore, I signed up to audition for Once Upon a Hutong, but as I had absolutely no drama experience, I didn't get in. As that school year progressed, I discovered what my strengths were, and auditioned for the International Schools Theatre Association (ISTA) Festival. I couldn't believe that I actually got in! From then on, I've been participating in most of the opportunities the MS drama program had to offer. And honestly, I'm so glad. "Drama is very important to me because it has helped me grow so much. It has turned me from a very negative and quite shut-off person into a more confident and energetic being." From the inclusivity of ES to the roller-coaster ride of the audition process in MS and HS, there are many such stories about how ISB students have benefited from performing arts.